“AIN'T GONNA SETTLE DOWN features all 14 recordings made by the obscure but remarkable cabaret star Mary Stafford in 1921 and 1926 and 32 selections by Louisville-born Edith Wilson, covering her entire released repertoire from 1921 to 1930. A handsomely illustrated 32-page booklet with notes by blues scholar Steve Tracy accompanies the two CDs. As usual, remastering and design come from Grammy-winning production team of Richard Martin and Meagan Hennessey. These records have never sounded better, and for the first time they are presented with the care they deserve. After Mamie Smith exploded onto the blues scene for OKeh in 1920 - proving once and for all that black artists and black consumers were a force to be reckoned with - all the other record companies responded with their best imitations. Lucille Hegamin followed for Arto in November 1920, but the first major-label offerings were Mary Stafford and Edith Wilson. Stafford began recording with Charlie Johnson's Orchestra in January 1921 and Wilson, backed by a formidable Johnny Dunn ensemble, in September 1921. What resulted is the purest, generally overlooked, iteration of the classic or vaudeville style of blues singing - which only now can be appreciated for its trailblazing character right alongside the guitar-slinging and knife-fighting kind of blues from the masculine set. White male writers who have chronicled the blues for decades have privileged the ‘primitive’ sound of the rural, guitar-playing, often indigent men who rightfully occupy their places in the blues pantheon. But these two talented women belong there too--and they were among the first. So said Willie ‘the Lion’ Smith in a moment of exuberant praise. Mary Stafford's recording career consisted of 14 released sides - far too few for a stage singer who could deliver the blues with strength and panache. Backed by ‘Her Jazz Band’ (which was really the Charlie Johnson Orchestra), Stafford burst onto the scene with the first released version of the future classic ‘Royal Garden Blues’ by Clarence Williams and Spencer Williams. For a suitable flip-side, Stafford does her own unique turn on ‘Crazy Blues’ - the Mamie Smith vehicle that started the whole blues craze. Mary definitely blows her ‘pipes’ on ‘Down Where They Play the Blues’ and ‘If You Don't Want Me Send Me to My Ma’, but something magical happens in the cacophonous beauty of the muddy ‘Wild Weeping Blues’. That one and its flip, ‘I've Lost My Heart to the Meanest Girl in Town’, are really meant as jazz band records, where Stafford is buried in the mix - yet her wailing cuts through the noise like a knife. Curiously, the studio engineers rethought that strategy and pushed Mary way up front when she returned four months later to record ‘Arkansas Blues’ and ‘Blind Man Blues’. The sound is noticeably thinner, allowing a focus on Stafford's smooth, nostalgic lament. That was September 1921; only one more recording – ‘Monday Morning Blues’ - followed in November 1921, and then Mary Stafford had a long break before her final recordings. She remained active, performing for example with the Carroll Dickerson Band and Frankie ‘Half Pint’ Jaxon (source of one of only two known photographs of her), yet it wasn't until Pathé-Actuelle recorded her c.March 1926 that she got back in the studio. The final selections were the double-entendre blues, ‘Ain't Got Nobody to Grind My Coffee in the Morning’ and ‘Take Your Finger Off It’. Stafford deserved a longer career, but at least with AIN'T GONNA SETTLE DOWN we can still visit her ‘down where they play the blues’. Mary Stafford may have been the direct response to Mamie Smith, but it was Edith Wilson who got her break at Mamie's expense. ‘Crazy Blues’ composer Perry Bradford had Smith slated for his show PUT AND TAKE, but when her stage manager wouldn't allow it, Bradford tapped Wilson to take her place. 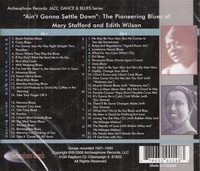 The result was a positive review for Wilson and her first three recordings: ‘Nervous Blues’, ‘Vampin' Liza Jane’, and the show-stopping ‘Old Time Blues’. She was backed by a very tight ensemble led by cornetist/trumpeter Johnny Dunn (formerly of W. C. Handy's Memphis Blues Band) that gave her recordings some of the best jazz accompaniments waxed to that date. Edith finished out 1921 with the spirited coupling of ‘I Don't Want Nobody Blues’ and ‘The West Texas Blues’, the latter featuring her doing a stop-time call and response and some tough sliding by trombonist Herb Flemming. Between 1921 and 1925, Wilson had 21 recording sessions and saw 26 sides issued from her labors. Most of the selections show off Edith's non-12-bar vaudeville-style vocalizing, often right next to instrumental breaks with the 12-bar standard blues structure. She remade the work of others, such as Lucille Hegamin's ‘He May Be Your Man’, but she also introduced a number of songs on record, including Perry Bradford's ‘Rules and Regulations' Signed Razor Jim, ‘What Do You Care’ and ‘Wicked Blues’. She was a regular stage attraction by the time she recorded ‘Daddy, Change Your Mind’. Gone now are Johnny Dunn and company, in favor of a crisp Fletcher Henderson band, with Don Redman on clarinet and Charlie Dixon on banjo. In early 1924 Wilson teamed with guitar virtuoso Roy Smeck (masquerading as ‘Alabama Joe’) on ‘How Come You Do Me Like You Do?’ and ‘Muscle Shoals Blues’. A full, tight band is back for ‘He's a Mean Mean Man’ and ‘Double-Crossin' Papa’, and then Edith is joined by stage partner Doc Straine on her first electric recordings, ‘It's Gonna Be a Cold, Cold Winter’ and ‘There'll Be Some Changes Made’, where the two exchange vocal volleys about the nature of their domestic tranquility. Absent from recording for four years, Wilson returned to the studio in 1929 to wax her big hit from the HOT CHOCOLATES revue, which ran for 219 performances. The song was ‘(What Did I Do to Be So) Black and Blue’, a Fats Waller tune with scathing lyrics by Andy Razaf about racial injustice. The song became a classic, with multiple recordings, including one by Louis Armstrong, and a place in Ralph Ellison's INVISIBLE MAN. Wilson followed this up by guesting with Bubber Miley and His Mileage Makers on ‘Loving You the Way I Do’ and ‘The Penalty of Love’, from the musical comedy HOT RHYTHM. Although she remained very busy in the 1930s with shows like the Edith Wilson Revue, SHUFFLE ALONG of 1933, BLACKBIRDS of 1934, and RHAPSODY IN BLACK (with Sam Wooding), Edith's final recordings of the 78 era came in October 1930 with the double-entendre ‘My Handy Man Ain't Handy No More"’and the sassy ‘I'll Get Even with You’.